In 1985 Beverly Bryan, Stella Dadzie and Suzanne Scafe, members of OWAAD (Organisation of Women of African & Asian Descent), published Heart of the Race, which presented a powerful corrective to a version of Britain’s history from which black women have long been excluded. 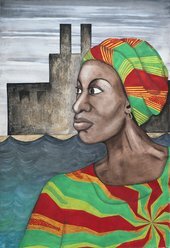 This seminal text explored the collective experience of black women in Britain, and their relationship to the British state throughout its long history of slavery, empire and colonialism. To coincide with its republishing this summer join original authors Stella Dazie and Suzanne Scafe, along with contributors to the new volume, Lola Okolosie and Heidi Mirza, for a conversation about their book and its enduring relevance, as they consider what has changed since its original release and what the priorities for black feminists in Britain are today. This event will include a response to the text from Hudda Khaireh of the artist collective Thick/er Black Lines, and will be moderated by writer and academic Nydia Swaby. Heidi Safia Mirza is Emeritus Professor in Equalities Studies, UCL Institute of Education and visiting Professor of Race, Faith and Culture at Goldsmith’s College, University of London. She is author of several best-selling books including Black British Feminism and Dismantling Race in Higher Education: Racism, whiteness and decolonising the academy. Hudda Khaireh is an independent researcher and artist with a background in Public International Law, whose practice focuses on the position of Black people globally. Hudda is a part of the Black Feminist artist- collective, Thick/er Black Lines, as well as an associate of Numbi Arts and OOMK Zine. Lola Okolosie is an English teacher and Guardian columnist. She has written for the Observer, The New Humanist and Stylist magazine, amongst other publications. Nydia A. Swaby is a historian and ethnographer working at the intersection of black feminist theory, migration and diasporas, and queer theory of colour. Nydia is a Senior Teaching Fellow in Anthropology and Sociology at SOAS, University of London. She is on the editorial collective for the journal Feminist Review. Stella Dadzie is a founder member of the Organisation of Women of Asian and African Descent. Her career as a writer, speaker and education activist spans over 40 years, gaining her an international reputation in her field. Suzanne Scafe is an Associate Professor of Literature at London South Bank University. She was a member of the Organisation of Women of Asian and African Descent and the Brixton Black Women’s Group. Learn more about Heart of the Race in a five-week reading group at Tate Exchange with Thick/er Black Lines, an interdisciplinary, research-led initiative applying contemporary art theory, cultural studies and social practices to rewrite histories and to negotiate a way forward.